This Italian-inspired Peas and Prosciutto side dish is easy to make and flavorful. Flavored with salty prosciutto, sweet peas, nutty Manchego, and Pinot Grigio, this is an easy to make and delicious vegetable side dish. With the abundance of cookies, cocktails, and decadent appetizers, it’s easy to overlook side dishes during the holidays. And not for lack of effort or creativity, but for lack of time. How can one justify not decorating sugar cookies? Or not baking up batches of gingerbread cookies for the annual cookie party (Nancy, I’m talking to you, yours are my favorite) just to make time for menu planning? So with time devoted to the many sweet and festive traditions , it seems to have become habit — or shall we say, tradition — to leave the side dishes until last, at least for some of us. Whether it’s a habit or not, this recipe aims to ease the stress of menu planning. It comes together in no time and offers simplicity and refinement to any holiday menu. 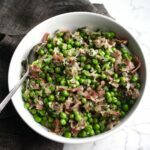 Classic ingredients like green peas, prosciutto, and wine combine with nutty Manchego and fresh mint to create an unexpected, super savory side dish that tastes as good as it is for you. Cook prosciutto in a large skillet over medium heat until it begins to crisp; transfer to a plate. Add oil to skillet and heat until shimmering; add shallots and sauté until softened, 2–3 minutes. Stir in peas and cook until heated through, about 4 minutes. Add Manchego, mint, and parsley and stir until combined and cheese is melted. Add wine, remove from heat and stir until liquid has evaporated; season with salt and pepper. Serve warm. If your peas are not thawed, you can still throw them in frozen, they just won’t retain the same vibrant green color as fresh will. Hi! I’ve been reading your site for a long time now and finally got the courage to go ahead and give you a shout out from Atascocita Tx! Just wanted to say keep up the great work!